Multi-award-winning, Tria’s Hair Removal Laser Precision targets the roots of hairs to ‘disable’ their follicles and gradually leave skin smooth and stubble-free. A permanent ‘at home’ solution, this travel-friendly, battery-operated device will de-fuzz smaller areas (bikini line or underarms) for good – liberating you from shaving, waxing or the pain of epilating. With three times the eliminating energy of other at-home hair removal devices, Tria’s Hair Removal Laser Precision grants safe, fast and permanent results. Using professional-strength diode laser technology, this innovative treatment targets pigment in hair’s follicles, which causes the hair to fall out and the follicle to be ‘switched off’. With continued use – the follicle is totally disabled which means that hair no longer grows – leaving small, sensitive areas (like face, bikini line or underarms) ever smooth and ready to bare. In clinical studies, the device has shown a 70% reduction in hair re-growth after just 2 treatments and after 3 months, the majority of follicles have been deactivated so that only rare touch-ups are necessary. Please be aware that the device will NOT work if you hair is grey, blonde or red and that it is not suitable with those for darker skin tones. It is designed to work on fair to light brown skin tones and light brown to black hair. By treating once every two weeks, you are closer to your goals of smoother, silky skin. Works effectively on light to medium skin and medium to dark hair. Prep the skin by cleansing, shaving, and towel-drying. This will allow the laser treatment to be most effective since the Tria Laser Precision works on the hair inside the follicle, under the surface of the skin. Unlock the laser by locating the skin sensor (red light) on the device base and hold it against the skin you wish to treat. This will ensure that it is suitable to use on your skin tone. If the Tria Laser Precision is safe for your skin tone, the device will emit a series of beeps and unlock. If the lock icon is still visible and you do not hear a series of beeps, then it may not be safe for you to use the Tria Laser Precision. The sensation of the Tria Laser Precision varies, depending on the person and treatment area. Start at a low treatment level (one or two) and then increase by one treatment level at a time until you've reached the highest treatment level comfortable to you. The higher the treatment level, the faster and better the results. Establish a treatment area and place the laser tip on the area of skin you wish to treat, making sure that it is flat on your skin. Hold the laser tip in place until you hear two beeps. After the beeps, just lift and place the laser tip on skin so that it overlaps the previous area by about one fourth of an inch. Make sure that the laser tip slightly overlaps the area that you just treated. Precautions: It will not work on darker skin tones or grey, blonde, and red hair. It is designed to work on fair to light brown skin tones and light brown to black hair. After first treatment, you may experience mild redness that should quickly dissipate within 24 hours. The Hair Removal Laser should not be used by or on anyone under the age of 18. The use of the Hair Removal Laser on or by children has not been studied and could result in serious injury. Tria Hair Removal Lasers are also not suitable for use on tattooed skin: tattoos, dark brown or black spots (such as large freckles, birthmarks or moles). Dark skin may absorb too much laser light, which can injure the skin. 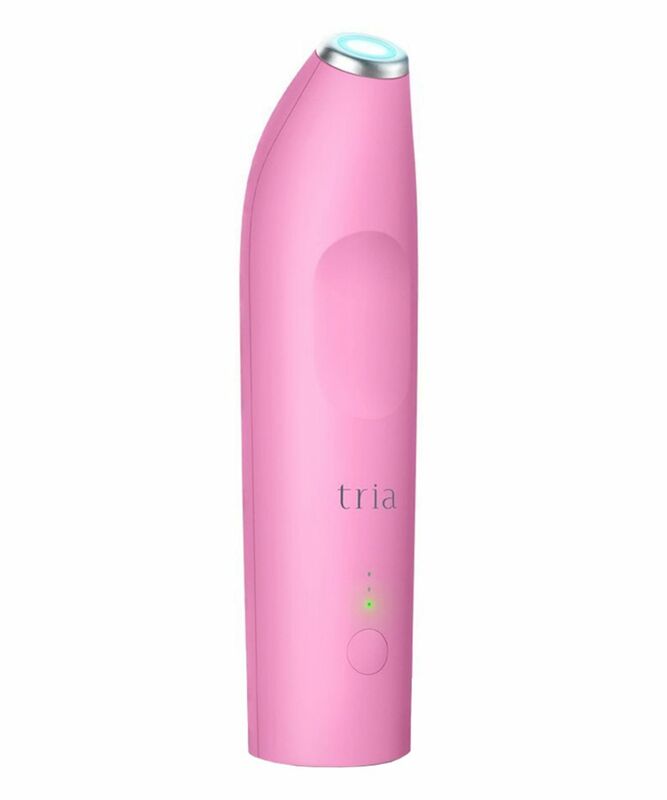 1 x hand-held Tria Hair Removal Precision (charge time 120 minutes, usage time 15 minutes), 1 x battery charger, 1 x user guide & 1 x 'Quick Start' guide. This laser epilator made it possible to remove hair even in hard-to-reach places. Now I do hair removal at home myself. I highly recommend this epilator, a proven thing.